Machining Services are metal removal operations which use a variety of contact and non-contacting tools to remove material from metals, plastics, etc. Machining services generally start with a raw material shape that approximates the shape of the final part, a round bar, for example, to produce a machined shaft. Conventional and CNC machining are the traditional machining methods that use cutters of hardened tool steel, carbide, etc. to literally cut away metal down to a final dimension. 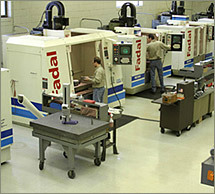 Conventional and CNC machining encompass processes like turning and milling. Other newer techniques include chemical machining and electrical discharge machining. Screw machining is an older but updated technology used to make many small cylindrical parts. Machining is well established among the metal working arts. In the modern era, computer numerical control machining has taken over much of the work that used to be done by traditional machining. These modern machine tools work from tool path programs to cut metal according to programmed paths and rates. Single head rotating lathes with stationary cutting tools have been overtaken by multi-axis machining centers with live tooling. Traditional machining still has it place, however. CNC has also made its mark on EDM machining and screw machining. While screw machining had been around a while, the latest generations of CNC machines have upped their productivity. And modern EDM machining owes much of its success to the computers which control their very fine motions. Machining services generally break out as shops that do conventional and CNC machining and those that specialize in screw machining, EDM, or chemical. Some shops offer some combination of the five services. Machining is an alternative to a host of other manufacturing methods including casting, forging, fabricating, molding, etc. In comparison to some other methods, it can produce high amounts of scrap. In general, it is very tolerant of low part counts, with the exception perhaps of screw machining which is economical mainly for high production volumes. Conventional Machining is the traditional method of turning, milling, etc. metal into parts which relies on the skills of machinists to operate machine tools. CNC Machining uses computer controlled machining centers, etc. to produce parts from programmed machine tool paths, often employing multi-axis machining within a single machining center. EDM Machining is a precision metal removal process which uses high energy sparks to vaporize metal. Chemical Machining are chemical and electrochemical metal removal processes used in producing large aircraft components and small intricate thin metal parts with the application of etchants. Screw Machining is an automated turning process used to make large volumes of small, cylindrical parts.